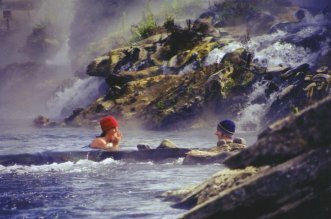 Envision yourself sitting in a natural hot spring with the water cascading over your back and shoulders while observing elk and antelope approaching to drink from the river that the hot spring empties into. Majestic mountains surround you, where eagles and osprey soar above you. Bathing suits and water shoes are required to insure a safe and relaxing soak. An experience you will treasure and, best of all there is no charge.